As this whirlwind season continued, all 35 English Football League games survived the threat of Storm Brian to deliver another busy afternoon of action. It was a Saturday when Aston Villa fans hailed John Terry's first goal for the club and Shrewsbury continued to take League One by storm, while others saw red mist. So what stories from the EFL might you have missed? Walking off the field because you've been sent off is a moment to forget. You hope you'll never have to do it again. But in bizarre circumstances at Molineux, Preston's Alan Browne had the unenviable experience of walking down the tunnel twice. 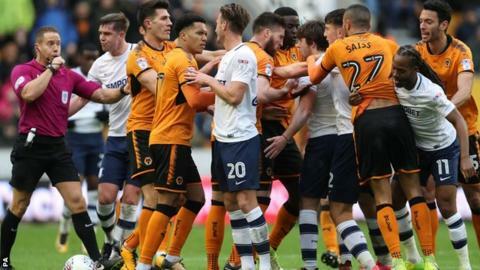 After fouling Wolves' Alfred N'Diaye in stoppage time when on a yellow card, Browne saw referee Steve Martin reach for his pocket, and quickly turned to head for the changing room. A melee ensued on the pitch involving other players, but eventually the official ordered Browne to come back out. Was there to be an unexpected reprieve? No, the referee hadn't shown Browne the red card and was determined to do so, to the amusement of some home fans, whose side held on to win 3-2 to remain top of the Championship. Clubs occasionally need to call on their second-choice goalkeeper when their first choice is injured - but two hasn't been enough for Plymouth Argyle. League One's bottom club used their fifth different goalkeeper of the season for Saturday's trip to AFC Wimbledon. Norwich City's Remi Matthews was signed on an emergency loan on Friday after injuries to three senior stoppers meant youth team keeper Michael Cooper, 18, made his debut from the bench at Blackburn on Tuesday. The latest change, though, proved a blessing in disguise as Matthews shone in Plymouth's 1-0 win at Kingsmeadow. A rare clean sheet helped Argyle end a run of 12 league matches without victory. When Mike Phelan's Hull won 2-0 at Swansea City on 20 August, 2016, they were joint leaders in an early Premier League table. At that time, Hillary Clinton held a nine-point lead in some opinion polls for the United States Presidential election and Sam Allardyce was looking forward to his first game as England manager. Yes, a lot can change in 427 days - except, it seems, Hull's away league form, which nosedived following that victory over Francesco Guidolin's Swans. But after more than 14 months without an away league win, the possibility of Hull's year as the UK's City of Culture being completed without the Tigers earning a single victory on the road was finally averted as they pulled off a 1-0 win at Barnsley. Frazier Campbell scored the only goal for the Tigers, who are now 14th in the Championship table. At 13:00 BST on Saturday, it would have seemed unlikely for unattached Wales striker Simon Church to be making any headlines. But after his move to Scunthorpe on a short-term deal was announced and he was named on their bench for the visit of Peterborough, that changed. With the hosts 1-0 down, on came the former Reading man and he played his part in an impressive turnaround, winning a penalty as they netted twice late on to win 2-1. Church had most recently been plying his trade in Dutch football for Roda JC, and Scunthorpe boss Graham Alexander decided to bring him in after watching him train. Alexander told BBC Radio Humberside: "It was something that just came up this week. His quality is known, but he's had a couple of injuries a year ago. "He had a part to play in the first goal, with the build-up, and he's won the penalty for the second goal. Hopefully we can get him up to speed and get the best out of him." After winning four of his five games in caretaker charge and signing a two-year deal to officially become the new Oldham boss, Richie Wellens may have been hoping for a straightforward first game in full charge. A thrilling 4-4 draw at Milton Keynes Dons welcomed the former Leicester City midfielder formally into managerial life, and pulse rates will have been high. Wellens' side were 4-2 up with eight minutes remaining, but late goals from the hosts' Aidan Nesbitt and Ed Upson ensured the points were shared.